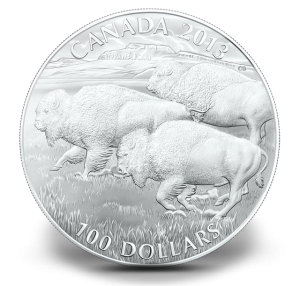 A Wildlife in Motion series debuts from the Royal Canadian Mint with the recent release of the 2013 Bison Fine Silver Coin. This strike is offered by the RCM at its legal tender face value of CAD $100. Each coin is struck from 99.99% pure silver. Shown on the reverse of the piece is a design of three bison. 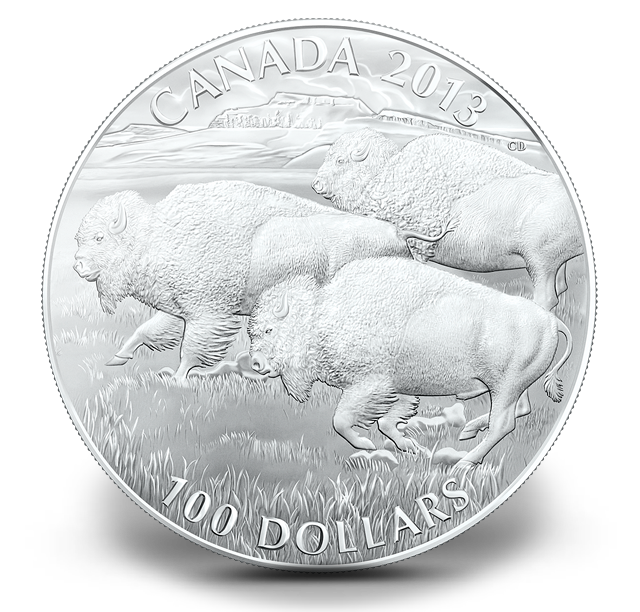 The release of the 2013 Bison Silver Coin marks the first time the Royal Canadian Mint has issued a $100 for $100 coin. Previous $20 for $20 releases from the Mint have proved popular with collectors, however. The smaller denomination series is now in its eighth release with the recently issued $20 Wolf Silver Coin. All previous releases achieved a sell-out with the Wolf Coin closing quickly on that same status. It is also important to note that while the $20 series has had a much larger mintage of 250,000 per coin, the Bison Silver Coin is limited to only 50,000. Also, the coin had a order limit of three in place when first initially released to members of the Royal Canadian Mint Master’s Club, but it has since been reduced to an order limit of one per household. The obverse depicts Susanna Blunt's effigy of Queen Elizabeth II. Obverse inscriptions include ELIZABETH II and D G REGINA. Minimum gross weight of each coin is 31.6 grams which is slightly more than one troy ounce of silver. The matte proof coins feature a diameter of 40mm. A Royal Canadian Mint display case is included with each coin along with an illustrated shipper. 1-800-268-6468 (US). Additional information on the release may be obtained on the Mint's website located at www.mint.ca.